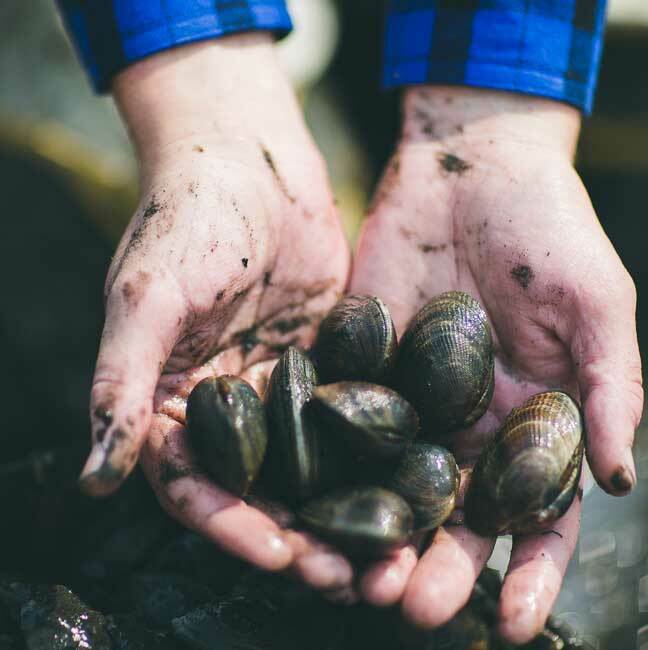 The Integrated Watershed Plan (IWP) goal is to ensure healthy bivalve populations throughout Hood Canal to enhance the ecological health of the marine environment and provide recreational, subsistence, and ceremonial harvest on designated public and private tidelands. Shellfish management is complicated because of the complex pattern of tideland ownership. Some tidelands are privately owned and others are publically owned. Shellfish populations are managed cooperatively by state and tribal governments. Harvest plans are developed to preserve, protect, and perpetuate shellfish resources while providing equal sharing of allowable harvest. Washington State Department of Health monitors shellfish growing areas to ensure that they meet water quality standards. The Washington Shellfish Initiative that recognizes the importance of shellfish as a cultural and economic resource to citizens and tribes. The initiative includes a series of actions that apply to Hood Canal, ranging from restoration of native shellfish to work with boaters to address potential pollution impacts. Learn more about how you can help protect our shellfish resources, including information from your local Public Health department on septic system care and options for homeowner assistance, like the Craft3 Clean Water Loan Program, which provides financial support for residents facing costly septic repairs and replacements. Over 94% of Hood Canal’s shellfish growing areas are in good health, and 3.4% have improved over the past decade. In 2014, there were approximately 27,080 acres of approved and conditional shellfish growing areas within Hood Canal. Roughly 1,500 acres remain prohibited to shellfish growing. Recreational shellfish harvest was open on 46 shoreline miles of Hood Canal public beaches in 2013. Note that the maps below do not show up-to-date shellfish harvest advisories. The Department of Health monitors marine water quality and shellfish contamination; please visit the Department of Health Shellfish Safety website to learn about current closures. How healthy are our shellfish growing areas? Where are shellfish located in Hood Canal? How many shellfish live in Hood Canal? What challenges do we face to keep our shellfish healthy? What are we doing to improve shellfish harvest in Hood Canal? Shellfish are generally found throughout Hood Canal, with notable exceptions at some river mouths and around Port Gamble and Port Ludlow. Oyster beds occupy most of the Hood Canal shoreline, with Geoduck clams common in the north canal and hardshell clams scattered around the entire Canal. The Washington State Department of Wildlife tracks shellfish densities (number of shellfish per square foot) at multiple locations around Hood Canal and has observed significant variations in the density of some species over the past decade. Residential and commercial development put pressure on shellfish resources, especially in the case of shoreline armoring or the construction of roads in or near near-shore areas. Residential development brings with it a higher density of onsite septic systems that age and, when not maintained, become less effective and leak, causing water quality conditions to deteriorate. Water quality impacts from wastewater discharges, polluted stormwater runoff, and chemical spills affect the establishment and productivity of many shellfish populations, and impact human health when we consume contaminated shellfish. Global climate change will also affect shellfish in Hood Canal. Ocean acidification is caused by increased carbon dioxide emissions and made worse by warming water temperatures. When ocean waters become more acidic, oyster larvae shells dissolve, reducing larvae survival in Hood Canal and other marine waters. Sea level rise and other climate changes over the next 50+ years are expected to dramatically alter the location and abundance of shellfish habitat in Hood Canal.